Hey hey! We had a total blast at Emerald City Comicon! Thanks so much for all the awesome fans that came by and said hi!!! You're all so sweet and awesome! The con was totally amazing thanks to you guys! Unfortunitly!!! We're taking a super small hiatus due to this double con month. We'll have a new page up April 23rd. Please take this apologetic Nilus image as a gigantic SORRY that we couldn't manage pages amongst the convention chaos and our day jobs! We'll be consistently posting again just as soon as we get out of this con-month! 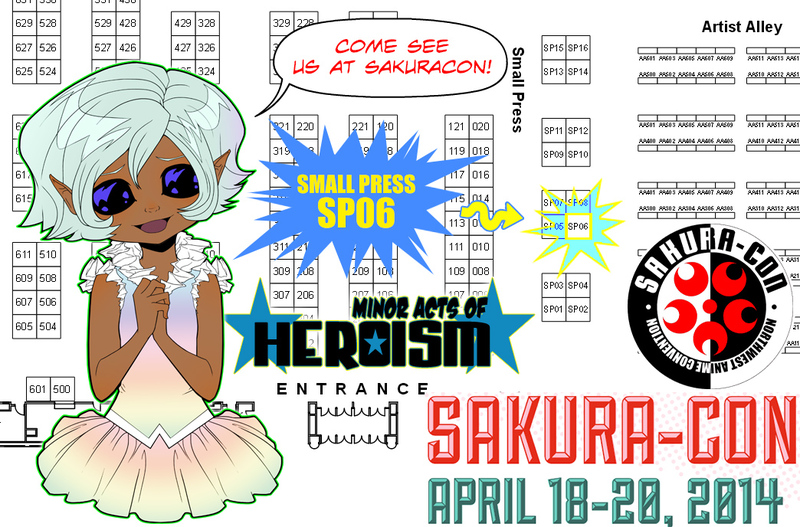 We will be at SAKURACON in just a couple weeks, though!!!! Please come by and say high if you're attending! OH MY HOLY PEPPERONI PISTOLS! DAT FACE! Quick! Which country is this "Sakuracon" happening in?!? JohnBow - SakuraCon is in Seattle! It's an awesome Anime convention. :) If you can go, I'd definitely recommend it. i am ashamed to be alive right now. m(_ _)m""""
it was wonderful to meet you both at sakuracon! i was the one buying a print for a friend that couldn't make it. she loved it so much!! thank you again!! For a second I had the false hope that you were coming to the Sakura festival in NY. haha, I wait patiently for your return, wish I could meet you in person but in the meanwhile I am loving the fashion.